In 2009, beavers took a lot of trees from our back property, and I openly worried about a little sapling that had held its golden leaves past autumn every year, far beyond the other trees. Its leaves were curved and balanced in such a way it looked (to me, anyway) like a golden Christmas tree. One afternoon in late October 2010, I looked out the window and saw Bob installing a protective fence around that sapling, to protect it from the varmints. He had responded to my open worry about that baby tree. In October 2011, as dusk was settling in, I took a photo of that little sapling (left foreground of the photo), for it had grown a lot since the previous October---thanks to my husband, who knew his effort to protect the tree impressed me! Better than diamonds and candlelight! And now I share a brand new photo of that tree, taken just after sunset on this evening of October 2014. The tree is thriving, growing tall and lovely; taller every year. I still see it as my autumn Christmas tree. 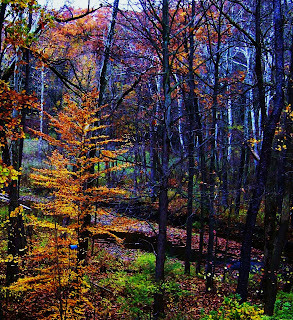 Every year its brightly tinted leaves still cling beyond the winter holiday. It still impresses me. So does my husband, whose down-to-earth, romantic efforts saved that tree. DEMOLITION OF THE Lake East Hospital in the city of Painesville is underway. Painesville residents have told me they find the demolition a sad process to watch, and that's not surprising. A hospital is part of a community's personal history, after all, and the old Lake East building is likewise a part of mine. During my childhood in the 1940s, the hospital was commonly referred to as the "Painesville Hospital." My brothers and sisters and I were ushered into the world at that venerable institution, as would later be my own three sons, and two of my granddaughters. My earliest recollection of the old hospital would have to be the year my father went there for major surgery. Operations weren't taken lightly in those days, and hospital stays were long. We kids were scared; our dad had been there far too long. Childrens' visits weren't allowed, and since we couldn't see him, we imagined awful possibilities about Dad's "true" condition. In response to our distress, the nurses bent the rules and pre-arranged some "visits", bringing Dad to an open window in a lower hallway at the southeast corner of that then-much-smaller building, where Dad would be allowed to see and talk to his children on the ground below. That act of kindness on the part of the staff was a balm as powerful as medicine for us, and perhaps for Dad too, and as I near the age of 70, I have not forgotten it. As with any family growing up, things happened that required medical attention. When a little brother fell out of a tree and was seriously hurt, the nurses at the Painesville Hospital treated him quite tenderly during his long confinement there; and when he left, it was with great reluctance. When another little brother later tore his hand while using Dad's old handsaw on a "secret project," I took him to a "new kind of place"--the hospital's newly-built emergency room! PRIMARY IN MY memories of that old hospital was the "Hospital Hill"--a green expanse of sloping land that rose upward from High Street, then swooped delightfully down toward Washington Street. It was a much favored sledding spot for Painesville youngsters. In winter snows, our rambunctious laughter surely drifted to the ears of patients and staff, yet no one from the hospital ever came to quiet us. It didn't seem the hospital's "QUIET ZONE" signs extended to the children romping on the hill outside. In fact, it seemed the staff might actually have decided the sound of children playing was a good thing for the patients. Also on that property was a graceful, long-windowed Victorian-style home we knew as "The Nurses Residence." 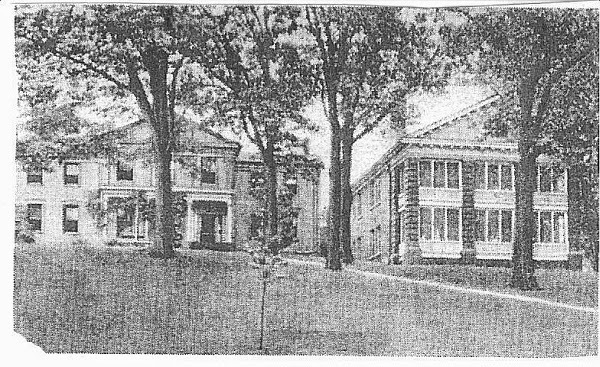 This building, demolished long before the hospital was demolished, was originally the home of a Dr. Stephen Mathews. It had been designed and built by premier Western Reserve architect Jonathan Goldsmith. Situated east of the open area of the hill on which we played, it had a wide veranda and was shaded by the best of Painesville's grand old shade trees. I loved the place! The hospital itself, as I recall it from the 1940s, was but a fraction of the size of the sprawling complex that occupied the land in its last years, and the entrance was a mere car-length or two from Liberty Street. Lawns extended from both sides, softening the hard edges of the old building's exterior. The City Health Department occupied a portion of the front of the structure, as did the morgue. In those years, we could greet the nurses as neighbors, for most were local women. (There were no male nurses in those days). In their uniforms they seemed to walk more briskly---straighter and taller---than in their "ordinary lives." Clad in white from head to toe, they wore crisply starched dresses and caps, and the white stockings and spotless white shoes that were also a trademark of their profession. For years, there was no emergency room, and no ambulances as we know them today. Local funeral directors transported victims for treatment, or families and neighbors simply put the sick or injured into a car and brought them in. For emergencies requiring transport, we dialed 0 for Operator, and all these phone operators were trained in the handling of distress calls of all sorts. The modern concept of the post-surgical recovery room had not yet evolved. Its substitute was the devoted attention of a bedside nurse, who would sit through the night to keep an eye on the patient. That sort of hospital may sound primitive today, but in the context of the times it served us well and had a worthy history in our community. THE SMALLER ORIGINAL hospital--the first in the county--had opened at the Painesville location July 8, 1904. It was housed in the old Reynolds house on High Street, several houses back from Liberty Street. Impetus for that simple, early hospital had begun with the New Connecticut Chapter of the Daughters of the American Revolution, and was picked up and continued by the women of Lake County. The first floor consisted of the matron's apartment, a kitchen, a large room converted to a ward, a bathroom, a porch, and a room which became a ward at a later date. The second floor would later consist of wards provided and furnished by local organizations. A nursing school opened at the hospital two years after its opening, with two students; Mrs. C.F. Wyman was superintendent. Requirements for young women who applied were basic, including "at least one year of high school credits... good health and good disposition." The students trained for two-and-a-half years at Painesville, with a last half-year at Cleveland City Hospital. When money problems of the Great Depression later forced the closing of the nursing school, its students were transferred to Metropolitan General Hospital in Cleveland. In 1924, a quarter-million-dollar expansion to the original hospital resulted in the building I recall from childhood---the old Reynolds house having been incorporated into the larger building, for administrative offices. 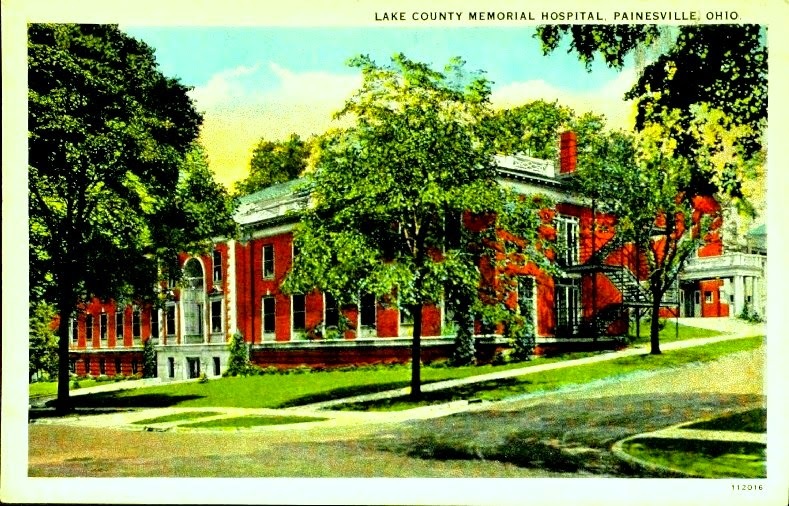 IN THE 1950s, the hospital began a long, steady period of change and growth that corresponded with the county's growing population and changing needs, and the new technologies. A big expansion project at Painesville in 1959 was coordinated with the opening in 1961 of an even larger second hospital in Willoughby. The west-end construction was financed by federal funds and a $3.5 million bond issue. When the Loblaw Supermarket was built on Washington Street east of the Painesville hospital, medical offices were included in the upper level. Close location to the hospital proved convenient for local doctors. After the supermarket closed, the Loblaw Building was acquired by the hospital, which continued to rent the facility to physicians. In its most recent years, the hospital complex covered the entire block encompassed by Liberty/Washington/St. Clair and High Streets--excepting a small private medical office on the southeast corner; in addition, parcels were purchased one at a time on the other side of High Street and on South and St. Clair Streets. By that time, the sledding hill was long gone, and the surrounding area bore no resemblance to the hospital neighborhood I remembered from the 1940s. IRONICALLY, MY HUSBAND and I were among the last people in the Lake East emergency room on the evening it closed and transferred its patients and services to Concord. So close were we to the closure and start of the actual move, the staff told me and my husband we might be included in the lock-down and transfer to the new TriPoint Medical Center's emergency room. That didn't happen; we were released within minutes of lock-down. But that evening I did wander through the stripped and empty halls of our "old Painesville hospital," and I felt as if I were walking through the streets of a suddenly deserted city. It was sad and unsettling. Old photo of nurses residence (left) and original hospital. AFTER-NOTE: The old hospital was demolished in 2009, the same year my old high school in that city was demolished. The replacements for both buildings have been stellar, but that does not erase the nostalgia for two old buildings that served our people well for generations. 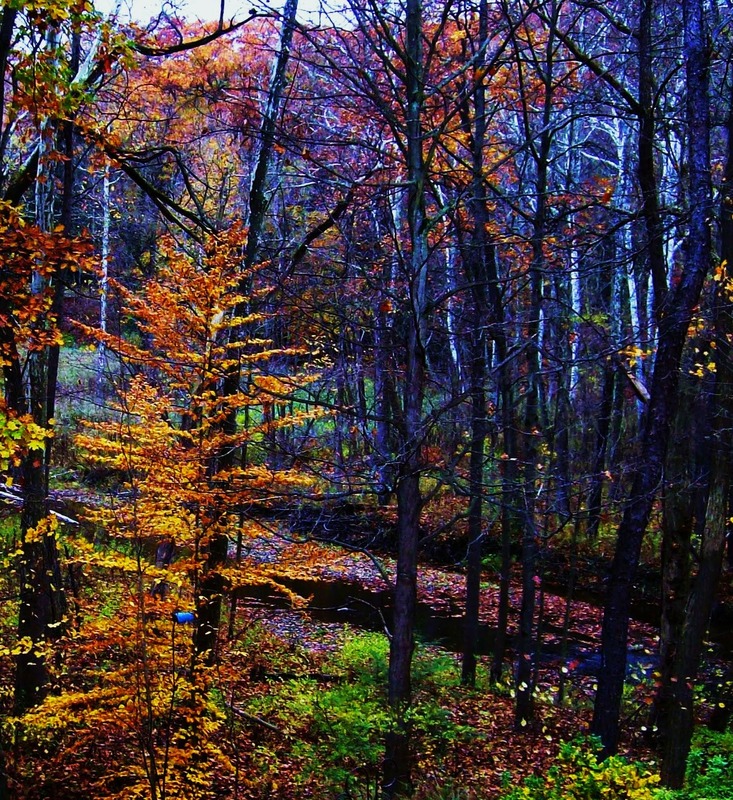 "For all its faults, I love October.